The Fendi men's fall/winter 2019/2020 collection marks the longest partnership between a fashion designer and a fashion house in history. The collection designed by menswear creative director Silvia Venturini Fendi sees Karl Lagerfeld’s integral artistic vision of Fendi as its main source of inspiration in a one-time, exclusive collaboration. Gold has been used exclusively in the collection for the apparels and accessories. 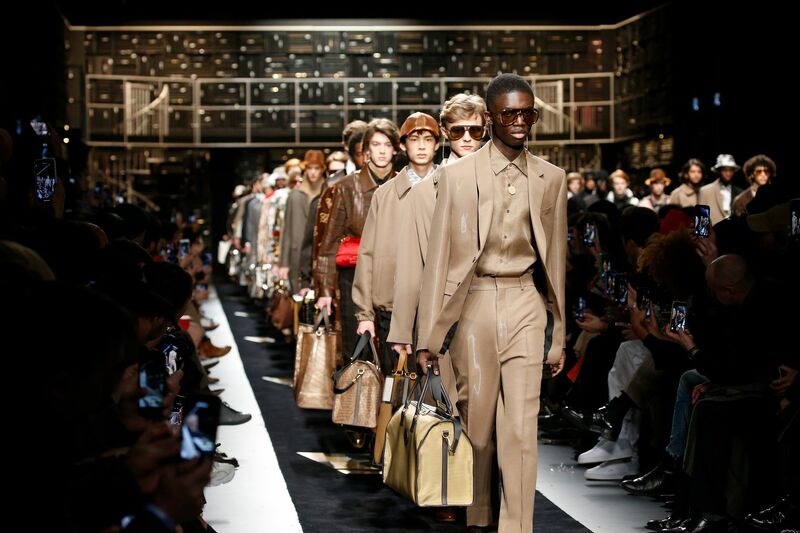 The men's fall winter 2019/2020 collection becomes the prime introduction of Karl Lagerfeld into Fendi's menswear universe alongside Silvia Venturini Fendi. Having invited Karl Lagerfeld as the “Guest Artist” for the collection, the play on fur and leather is apparent in his sketches from the boots camouflaged under leather pants to fur sewn bags and printed suitcases with the classic double-F monogrammed logo. Also thrown in the mix, a range of rugged masculinity and even femininity inspired from the 70s with turtle necks and V-neck jumpers as well as the gold accessories of necklaces and sunglasses. The double-F monogrammed logo can be spotted repeatedly. The year 1965 oversees the era of modern plastics being incorporated in fashion design and it was also the year when Karl Lagerfeld was appointed as the artistic director of the renowned fashion house, Fendi at a time where leather and fur were still abundantly employed. Silvia Venturini Fendi is the only descendent still working at the company founded by her grandparents in 1925 and she reminisced that she was only 5 when she first met Karl Lagerfeld. The designer then went on to revolutionise the house's fur atelier from producing designs with bourgeoisie fur to what he calls, "fun fur". Read also: Put The Drama Into Your Party Look With This Holiday Season's Fendirama. Quirky asymmetrical designs like the shawl and shirt above are featured. There is eccentricity to some of the designs as Karl Lagerfeld engaged with asymmetrical elements by having opened gold zippers from a two-toned shawl’s collar to a notch lapel revealing a translucent blue shirt underneath. The monochromic hues of brown, black and grey becomes more evident when there’s a shocking vibrant colour like a red sling bag and a gold hooded sweater. Musician and Brand Ambassador for China, Jackson Wang and celebrities who among others are Netflix stars, Noah Schapp and Kiernan Shipka rocked recent designs at the men's fall/winter show. The elegance of sartorial tailoring known as Fendi's trademark is once again emboldened in the menswear collection and highlights the effortless spontaneity in formality.